When preparing a Hyper-V environment that spans subnets, subnetting may need to be taken into consideration for any applications that are running inside the virtual machine. Some applications “hard code” IP addresses into their configurations. When these types of applications are loaded in a virtual machine that is replicated (via a DataKeeper replicated volume) to a target server on a different subnet, they may not operate as expected due to the difference in the network settings. 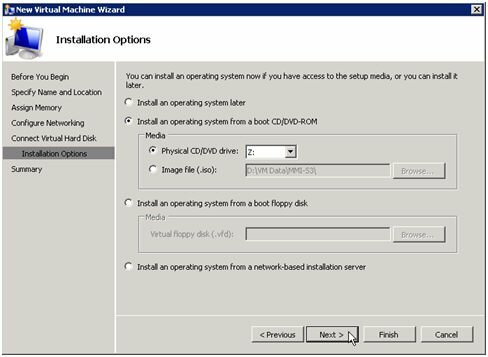 Install Windows on two servers with at least two partitions, one for the OS and one for the Hyper-V virtual machine (VM) files. The partition for the files on the target server must be of equal or greater size to the source server’s “data” partition. 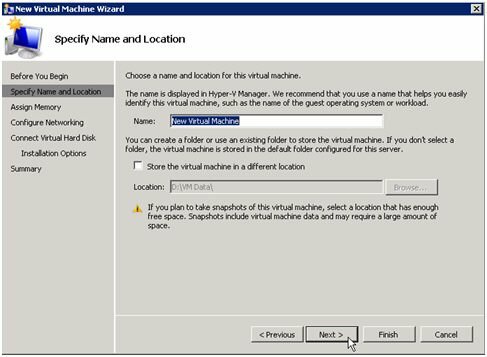 Install and configure the Hyper-V role on each server as described in Microsoft’s “Hyper-V Planning and Deployment Guide” and the “Hyper-V Getting Started Guide”, but wait to create your virtual machine until the DataKeeper replicated volume has been created. Complete the installation requirements for the SIOS DataKeeper software. Once you connect, new options will appear in the center pane. You can also optionally review the Server Overview report to see the status of your volumes. When you connect to multiple servers that have DataKeeper installed and licensed, you will see multiple servers and volumes listed here. Create a Job / Mirrored Volume. Note: When you select your source server, ensure you select the server whose volume you want to replicate from. Reversing the source and target in these steps will completely overwrite your source volume with whatever is on the target server’s volume, even if it is empty, causing you to lose any and all data stored on the source volume. 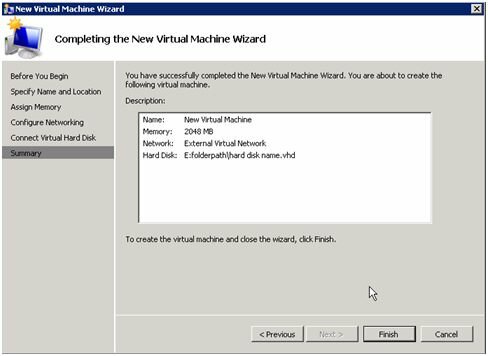 Launch the Hyper-V Console from Start – Administrative Tools – Hyper-V Manager. Specify the amount of RAM to use. Select a network adapter to use. 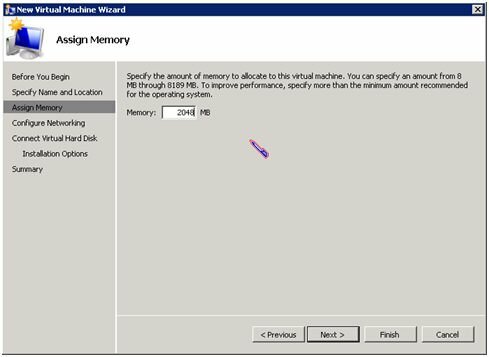 Create a new Virtual Hard Disk on the replicated volume (or copy an existing VHD onto the replicated source volume and point the creation wizard at it to use as the virtual disk). Specify the operating system installation options. Finish the wizard and start the virtual machine. Load the operating system into the virtual machine as dictated by industry or vendor specified best practices. 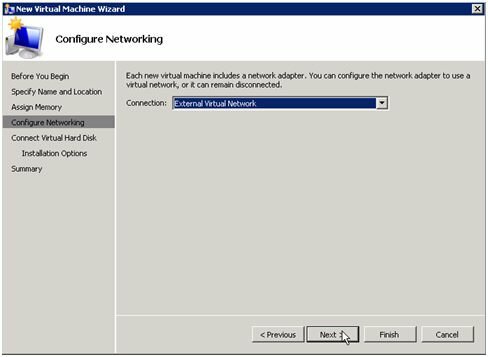 Configure the networking within the virtual machine to use DHCP addresses. Use DHCP reservations and name resolution (DNS or WINS) records as well if necessary for address consistency for client connections. Install any necessary applications in the virtual machine. 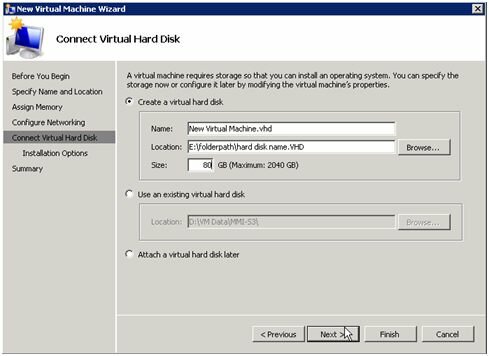 On the source Hyper-V host server, open Hyper-V Manager, connect to the virtual machine and do a full shutdown of the virtual machine. These actions will quiesce the data on the disk and will maintain data integrity on the target server. Start the DataKeeper console as described previously. Ensure the volume has been fully mirrored by checking the mirror status. The status must indicate Mirroring with the zero KB Resync Remaining. 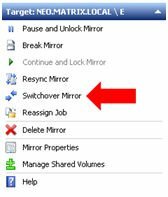 Select the mirror and click Switchover in the Actions pane. This will reverse the source and target and allow you to provision the virtual machine on the target server. On the target server, start the Hyper-V Manager. *IMPORTANT: Use the existing virtual hard disk on the replicated volume. Click Finish to finalize the virtual machine creation process. Start your virtual machine and test it to make sure it operates as expected. Initiate a Planned Switchover to migrate the virtual machine back to your source server. Initiating a switchover for testing or in the event of an actual outage on the primary server can be completed simply by doing a Planned Switchover. There are two types of switchovers, planned and unplanned. A planned switchover is typically done in a maintenance window when the user community can be advised of planned downtime. On the server on which the virtual machine is running, start Hyper-V Manager, as previously described, and connect to the virtual machine. From inside the virtual machine, Shut Down the virtual machine. On the same server, start the DataKeeper console as described previously. Ensure the volume is in mirroring state by checking the mirror status. The status must indicate Mirroring with the zero KB Resync Remaining before switchover occurs. Wait until the mirror has completely switched over and the DataKeeper user interface (UI) indicates the roles have been reversed properly. Log into the Hyper-V host server that just became the source server in the DataKeeper interface. 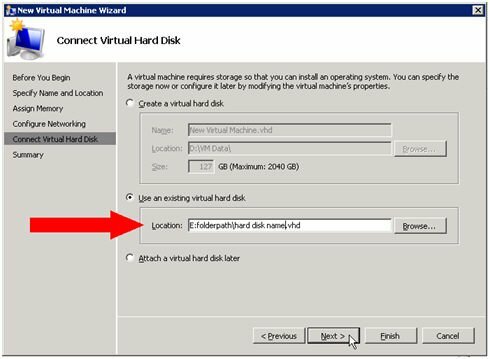 Start Hyper-V Manager as described previously. An unplanned switchover is necessary when a failure of some sort occurs and either the source system is unavailable or the connection between the systems is broken and requires that the virtual machine be brought online on the target server. Since, in this scenario, the source server is unavailable for some reason, quiescing the data on the source server is not possible and as such, only the following steps are necessary on the target server to bring the virtual machine online. On the target server, start the DataKeeper console as described previously. Wait until the mirror has completely come into service on the server and the DataKeeper user interface (UI) indicates the functional server is the source server. 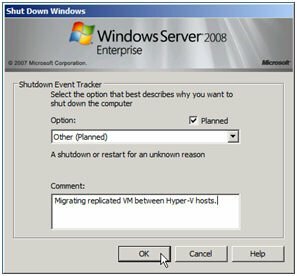 On the same server, start Hyper-V Manager as described previously. Switchback is a planned event which transfers the virtual machine from the target server back to the source server and, in process, is exactly the same as the planned switchover process. Please refer to the steps previously listed in the Planned Switchover section to affect a switchback.